John Gosling appears to have been born in Wiltshire in about 1771. Mary Lewis, daughter of Jonathan and Mary, was baptised in Chiseldon, Wiltshire, on 7 June 1772. She may have been the Mary who married John although the marriage has not yet been found and from her burial record John’s wife appears to have been born in about 1767. The first two children’s baptisms name their mother as Mary Lewis. Mary Gosling of Coate, aged 58, was buried at Chiseldon on 13 April 1826. John Gosling of Coate, aged 62, was buried at Chiseldon on 27 July 1834. Shadrach 19 Sep 1824 Crayford, Kent died young? Robert was a general dealer living in Bexley in 1841, but soon afterwards moved to Northfleet where, in 1851, he was the ‘Beer Shop Keeper’ at ‘The North Star’ in or near Providence Place. However, by 1861 he had moved to Gravesend where he was recorded as a labourer. He died there in 1864. Ruth 2 Oct 1844 bap.22 Oct Brookthorpe, Glos. In 1841 John was a labourer living in Startton St Margaret. He moved to Brookthorpe in Gloucestershire and in 1851 was a railway labourer. He was still working on the railway in 1861 when he was living in Cranham, Gloucestershire. In 1841 William was recorded as a butcher but by 1851 he was farming 100 acres at Badbury Wick and employing 5 labourers. He was farming 100 acres at Coate, Liddington, in 1861. This may have been the same farm as Coate is very close to Badbury Wick. Hannah died in 1873. 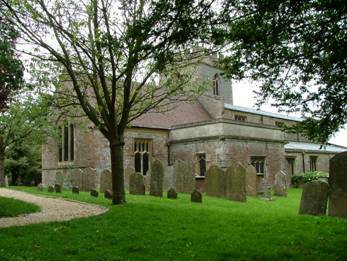 William Gosling of Coate, Lyddington, aged 73, was buried at Chiseldon on 22 April 1876. 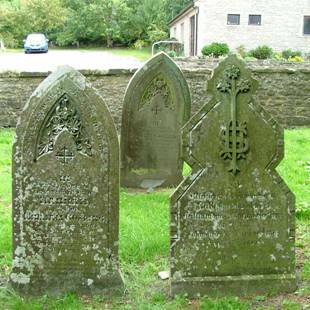 Their headstones and one to their daughter Ruth are shown below. Jonathan Gosling of Coate, aged 28, was buried at Chiseldon on 21 December 1834. Elizabeth married Thomas Adams in 1829.